Joe Biden in retirement is not a pretty picture: grouting bathroom tile, napping and watching Barack’s globetrotting adventures with the likes of Bradley Cooper and Justin Trudeau on cable television. Barack has yet to call him and he feels the sting as would a jilted lover. “No late-night texting. Not even a friendly poke on Facebook,” he laments. 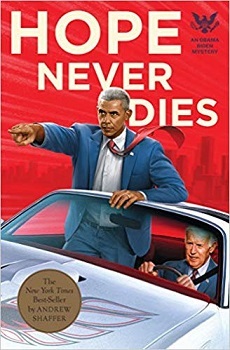 In Andrew Shaffer’s Hope Never Dies, Joe learns of the mysterious death of his favorite Amtrak conductor, Finn Donnelly, hit and killed on the railroad tracks by the Wilmington train, the same train Joe rode daily for so many years when commuting from his home in Delaware to the Senate. Heroin was found in the man’s pocket and he was clutching a Google map printout pinpointing Joe’s home address. Was the man drugged and his body dumped on the tracks? Was he trying to get in touch with “Amtrak Joe” for help? Wanting to clear his friend’s name of any criminal wrongdoing, Joe takes it upon himself to investigate. They throw themselves into the investigation, abandoning the obvious Escalade for Joe’s neon-green Dodge Challenger, inventing thin disguises, and having run-ins with biker gangs, corrupt cops and drug dealers. The match-up of Obama’s cerebral Holmes to Biden’s bumbling Watson plays well, and readers who are nostalgic for the previous administration will enjoy the real-life tidbits about the two Shaffer works into dialogue and plot. As an aside, during his years in the Senate, Biden was a huge proponent of public transportation and was well-known to constituents as he rode Amtrak on his daily commute. He began this practice after a tragic accident in 1972 took the lives of his wife and 1-year-old daughter; as a single parent to his surviving sons, Biden opted to commute daily to D.C. rather than maintain a residence there in order to be home with them each evening. Conductors knew him well and would occasionally hold trains for a few minutes if he was running late. Shaffer confesses that he wanted to write Biden into an action novel ever since first seeing a photo of him wearing mirrored aviator sunglasses. The idea for this mystery came during the weeks after the new administration took office when news channels constantly ran footage of Obama on what seemed like an endless vacation. Shaffer couldn’t help but wonder what Biden was doing and how it would feel to have such an intense partnership suddenly severed. The mystery works largely because of its exploration of estranged friendships that take faltering steps to reunite in changed landscapes. If you enjoyed the spirit of the Obama/Biden memes blasting around the Internet post-2016 election, I’m pretty sure you’ll find this mystery a refreshing break from the daily news. Shaffer keeps his political messaging light, instead focusing on the “bromance” aspect of our former POTUS and his veep in this wacky buddy whodunit. Some reviewers have questioned Shaffer’s purpose in writing this book. Was it nostalgia for a bygone administration? Therapy? Satire? I advise not thinking too deeply about it; just enjoy the slapstick ride.